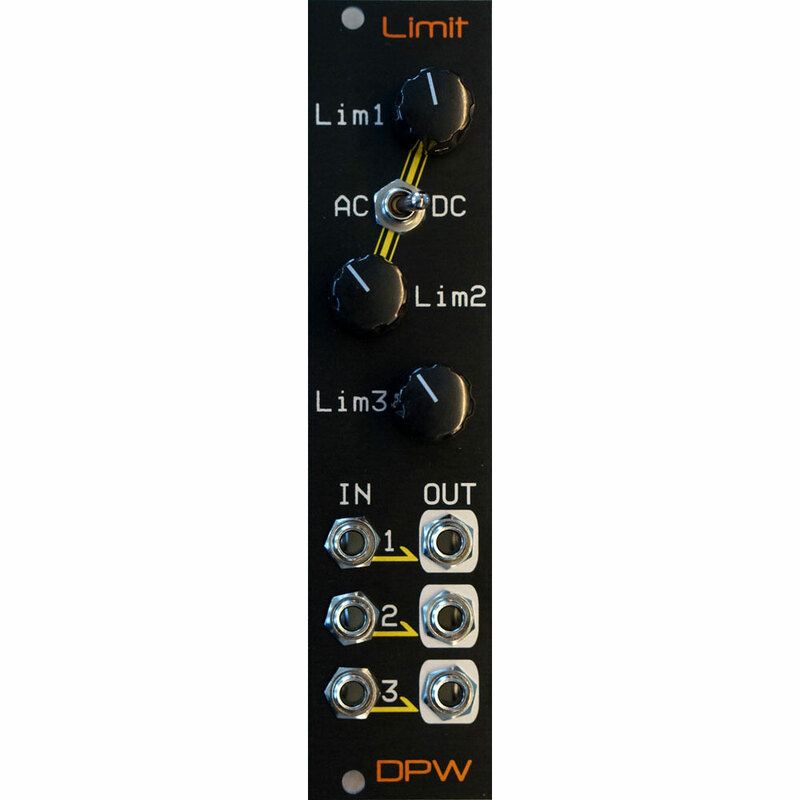 The L-1 is a three individual soft knee limiter module in Eurorack format. An all analog unit. It can be used for audio signal manipulation or as a utility module for control voltages. The three channels can be AC or DC coupled. It can be used for normal limiting/compression but also for creative wave shaping. The soft knee of the limiter is actually 8 consecutive soft knees for each channel starting at -6dB compared to 5V and spread evenly up to 5V. 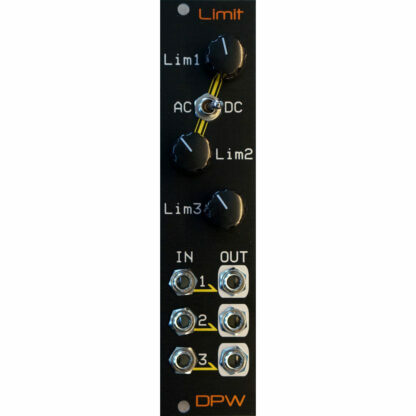 The limiter will brick wall limit to +/- 5V both in AC and DC mode. In other words it will gradually increase the compression from +8dB and brick wall limit at +14dB. For each of the three channels there is a volume control that controls how hard the limiter is driven. When the knob is at 9 o’clock what passes through is almost unaffected. Turning the the knob to full will give 5 times amplification drive in to the limiter, giving a rounded distorted sound. The three channels are completely independent. AC/DC coupling for Lim1 and Lim2 is done with the switch on the panel. AC/DC coupling for Lim3 is done by a jumper on the back of the module. When the jumper is mounted Lim3 is DC coupled. The module is delivered with the jumper mounted. If you need more compression than one limiter can do just connect OUT from one limiter to IN on the next. Module size: 6 hp wide, 25 mm deep with power connector. Connect the power cable with the red stripe (-12V) down. The unit is protected for reverse power.